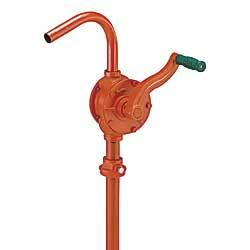 Model PFI-XP-471 - Cast iron for gasoline, diesel fuel, kerosene, and light oils. 6 GPM. Model PFI-XP-472 - POLYPROPLENE PUMP - Polypropylene pumps are ideal for most water-based solutions, alkalies, detergents, waxes, disinfectants, mild acids, corrosives, and water-soluble inorganic chemicals. 6 GPM. Wetted parts: polypropylene, Ryton, Teflon®, stainless steel. SPECIFY CHEMICAL TO BE PUMPED. Model PFI-XP-473 - RYTON PUMPS - Ryton pumps are for aggressive chemicals such as ester, alcohols, hydrocarbons, water based solutions, acids, corrosives, detergents, waxes, and disinfectants. Discharge and suction tubes are stainless steel. Ryton vanes, Teflon®, and stainless steel seal. 7.5 GPM. SPECIFY CHEMICAL TO BE PUMPED.